Blurb Description: Sixteen-year-old physics nerd Aysel is obsessed with plotting her own death. With a mother who can barely look at her without wincing, classmates who whisper behind her back and a father whose violent crime rocked her small town, Aysel is ready to turn her potential energy into nothingness. There’s only one problem: she’s not sure she has the courage to do it alone. But once she discovers a website with a section called Suicide Partners, Aysel’s convinced she’s found her solution: a teen boy with the username FrozenRobot (aka Roman), who’s haunted by a family tragedy, is looking for a partner. Even though Aysel and Roman have nothing in common, they slowly start to fill in each other’s broken lives. But as their suicide pact starts to become more concrete, Aysel begins to question whether she really wants to go through with it. Ultimately, she must choose between wanting to die or trying to convince Roman to live so they can discover the potential of their energy together. This is a gorgeously written and compulsively readable novel about the transformative power of love, heralding the arrival of an extraordinary new voice in teen fiction, Jasmine Warga. "He squeezes my hand so tight, I can't feel it anymore. I wish someone would do that to my heart." Truth be told, I haven’t had a great track record with books that deal with suicide. The only ones I’ve read were disappointments. The first was Thirteen Reasons Why by Jay Asher, and somebody over-hyped it for me so much, I just couldn’t enjoy it. The second was Playlist for the Dead by Michelle Falkoff, which I DID NOT GET AT ALL. SIGH. 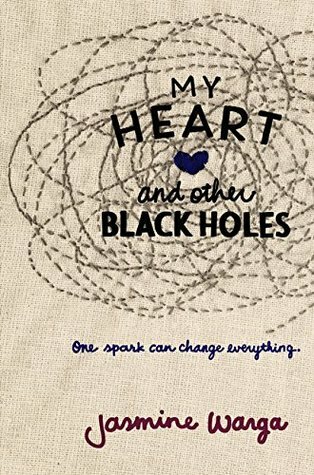 And while the description of My Heart and Other Black Holes intrigued me, you could call me a little jaded about books on this topic. Long story short, THIS IS THE BOOK I’VE BEEN LOOKING FOR. "Sometimes I wonder if gravity is the problem. It keeps us all grounded, giving us this false sense of stability when we're all really just bodies in motion." And so in the town that would rather just see her gone, she finds a website connecting potential suicide partners, and that’s just what Aysel needs. Roman (aka Frozen Robot) is not the kind of person who contemplates suicide. He is popular, a jock and has lovely over-the-top parents. Well, he used to be. Now Roman is haunted by a mistake he made, and one he can never forgive himself for. Aysel and Roman, in a different world, would never have been friends. But in this screwed up world, can two people that want to die, convince each other to live? following her around everywhere. She can’t live with herself when she knows the madness can take over, but, most of all, Aysel doesn’t want to sit around waiting to become her father. 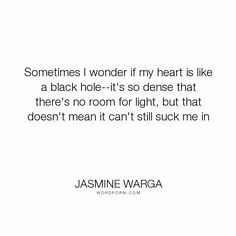 "I wonder if that's how darkness wins, by convincing us to trap it inside ourselves, instead of emptying it out." I think, the minute I opened the book, the only thing I wanted was for me to FEEL SOMETHING, and the only way to do that is to make it all believable. And in the middle of Jasmine Warga’s masterfully crafted tale, there I was. HOOKED. HOPING. Falling. Believing. Loving. Living. Dying. 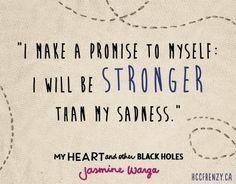 My Heart and Other Black Holes, despite my slightly jaded attitude towards it, managed to blow me away. It was complicated where it needed to be, deep when the reader needed to understand, poignant in ways that cannot be described and hopeful in the darkest of times. 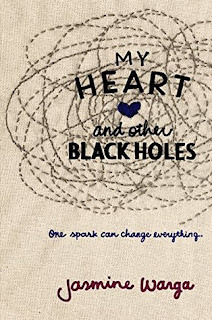 My Heart and Other Black Holes will make you feel everything in the most heart-breaking yet beautiful way possible. GO READ IT. Now that I've fallen head over heels for this book, I'm DYING to read another suicide/ depression book. SUGGESTIONS? Have you read this book? What did you think of it?